The two-hand set shot, once the favored shot in basketball, is largely a thing of the past. Pros Dolph Schayes and Clyde Lovellette were probably the last of the truly great two-hand set shooters. Contributing to this decline is the fact that many coaches have cut down the distances from which they allow their players to shoot. In addition, the universality of the one-hand jump shot, with players able to get a shot off much closer to the basket, and the players’ increased mobility and up-tempo play in recent years have all helped to foster the demise of the two-hand set shot. The best that can be said for two-hand set shots is that they increase a player’s effective shooting range. In the two-hand set shot, the shooter’s feet should be parallel rather than staggered, and squared to the basket. The ball is held in front of the body in both hands. The elbows are down at the shooter’s side rather than extended. Both hands guide the ball toward the basket. In releasing the ball, the player imparts backspin by an outward flipping motion of his hands as they rotate toward a position in which the palms face the basket. The arms should be extended fully toward a straight-arm position with the hands held high in a follow-through position. Another of basketball’s dinosaurs is the two-hand underhand free throw. With the exception of pro Rick Barry, one of the finest free-throw shooters in the history of basketball, nobody in recent years has made a mark shooting underhand free throws. This is an extremely accurate and extremely specialized form of shooting, and nowadays most players prefer to use a one-handed set shot when practicing free throws. The two-hand underhand free throw is a soft shot that often results in the ball rolling in even when shot slightly off line. In addition, muscle fatigue in this shot is not as detrimental as in other shots in which the ball must be supported from beneath before being released. In preparing for this shot, the shooter places his feet in a position that is comfortable for him. His arms should be relaxed, and his elbows should be bent but resting at his sides. The fingers of both hands are pointed down as the ball is held in front below the hips. The hands should be slightly below the center of the ball with fingers spread. 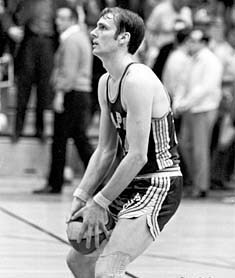 The shooter bends his knees as he lowers the ball, and the fingers of both hands move down and back toward his body. As the upward shooting motion begins, the shooter’s elbows should start forward before his hands. He guides the ball with his arms, and his hands follow the ball toward the basket as his wrists flip the ball.